Each year, more than 300,000 sports-related traumatic brain injuries occur in the United States. These brain injuries are also known as concussions. Concussions can happen to any athlete, male or female, in any sport. While such injuries may not always be preventable, physicians and athletic trainers are able to do more to recognize and treat concussions to make sure athletes are fully recovered before resuming play. Returning to play too soon after a brain injury, or concussion, may lead to serious life-threatening complications. A computerized neurocognitive test is one tool, when accompanied by a thorough medical exam, that may assist a qualified physician with the return-to-play decision. Baseline neurocognitive tests evaluate the healthy athlete’s decision making ability, reaction time, attention and memory. In the event of an injury, a re-test would give the physician additional information to safely return that athlete to competition. Although a neurocognitive test will never replace a thorough clinical exam by an experienced clinician, it can be a valuable tool in safely returning an athlete to participation. The incidence of sports-related concussion is estimated at 300,000 per year. Recent studies estimate that the likelihood of an athlete that plays a contact sport sustaining a concussion may be as high as 19% per season. A concussion is also referred to as a mild traumatic brain injury. The brain is the control center of the body and is responsible for the way an athlete feels and acts. When a brain injury, or concussion, occurs it can alter both the physical and emotional actions of the athlete. The results of this test will be used as a baseline test. If the athlete receives a concussion he may be retested. The results of the two tests can be compared and used, in conjunction with a thorough physical exam, to help safely return the athlete to participation. What is a neurocognitive test? This tests the function of the brain and how it relates specific thought processes and behaviors. This is a computerized test that evaluates these thought processes. Neurocognitive testing has been used in the evaluation of mild traumatic brain injury for many years but more recently with sports concussions. Used in college and professional sports for more than five years, this test is currently being used in the NFL, NHL, NBA, USA Olympic Team, The Ohio State University and several area high schools. The test used by Nationwide Children’s Sports Medicine is a computerized test. The test will use a computerized deck of cards and the athlete’s responses to assess the athlete’s decision making ability, reaction time, attention and memory. The athlete will be allowed a practice session prior to the measured test so they are aware of the testing procedure. This test will be used as a baseline test for the healthy athlete. The entire test should take approximately 15 minutes. When will I get the results of my child’s test? The results will be compiled and remain on file at the Nationwide Children’s Sports Medicine and Orthopedic Center in Westerville. If your child receives or is suspecting of receiving a concussion, he/she can return for further evaluation and re-testing. We can then compare the scores to see if your child’s brain function has been damaged and to what extent. How much does it cost for an individual to have Concussion Baseline Testing? Individual athletes can complete baseline neurocognitive testing at Nationwide Children's Hospital Sports Medicine and Orthopedic Center in Westerville. The fee for an individual baseline test is $15.00 per athlete. Are there requirements to have athletic trainers come to my location for Concussion Baseline Testing? 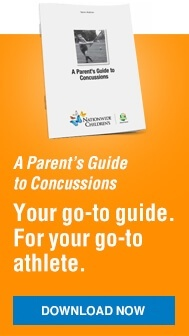 In order for our athletic trainers to travel and administer the test, please contact us at (614) 355-6000 or ConcussionClinic@nationwidechildrens.org. How do I sign my school or organization up to have the test taken? For more information regarding our Concussion Baseline Testing at Nationwide Children's Hospital Sports Medicine or for questions, please email us at sports.medicine@nationwidechildrens.org. How do I sign my child up to have the test taken? Please complete the form below and a Sports Medicine staff member will contact you to schedule an appointment. I give my permission for my child to have a baseline neurocognitive baseline test administered by Nationwide Children’s Sports Medicine. This test will remain on file at Nationwide Children’s Sports Medicine. A retrospective study may be performed in the future using information contained during the testing process.